Great news for game lovers, Amazon has announced partnership with the different video game developers such as Zynga, Gameloft, Electronic Arts, Rovio and PopCap.Kindle Fire is already supporting a thousand applications but this tablet will have more interesting games for the users. Here are titles: Angry Birds, Plants vs. Zombies, Peggle, Cut the Rope, Doodle Jump, Fruit Ninja, Age of Zombies, Pac-Man, Drift Mania and Jenga. Amazon also reported that it is testing some more application for the Kindle Fire that’s mean you can expect more from this upcoming tablet which will be launched on 15 November. In order to attract the attention of the users, Amazon will give away each application for free every day. If you love music and videos then Amazon Kindle Fire will also bring streaming services like Netflix ( also offered by Nook Tablet-true rival of Kindle Fire), for movies and television shows, Rhapsody and Pandora for music In case you like to expand your social networks then you will get ready access to LinkedIn, Twitter and Facebook. 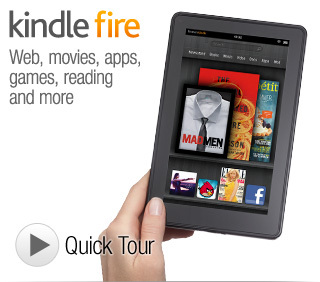 I’m sure you would like to buy Amazon Kindle Fire. In case you want to get the clear idea about Amazon kindle Fire then you can read the review of Kindle Fire.